Our facility located at 1/35-43 Lacey Street Croydon is the education centre for our customers. Solar power in general can be confusing and assessing which system is right for you can be daunting for some people. Here at our showroom you have the opportunity to educate yourself on all the different facts about solar in order to make an educated decision. Established in 1994, Energy Assist is an Australian owned and operated company with years of experience in the solar power industry. Our focus is on creating a high-quality solution that is right for you, your property and your budget. We listen to your needs, analyse your bills and engineer the right system for you. We have our very own Showroom & Testing Facility located in Croydon, East of Melbourne in Victoria where we have multiple systems installed, operating and monitored. At our facility, we test the panel performance and compare panel to panel by reviewing our monitoring results. 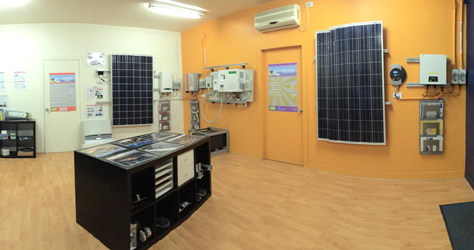 We have panels and inverters on display so you can visualise the components that make up your whole solar system. Here at Energy Assist we install all types of solar power from residential systems to commercial systems as well as on and off grid battery backup systems. We have installed a huge range of system sizes from 12 panels all the way up to 1,870 panels. So, for all your solar power needs contact us today for great advice, great packages and great installations. It is vital that a solar system is installed by a Clean Energy Council (CEC) accredited installer who has undergone extensive training to ensure systems are installed correctly and safely. You may have purchased the best panels and the best inverter however if the system is not installed correctly it may underperform and may be dangerous to you and your property. It is also important that your installers have engineered your system specifically for your property, every home or office building is different therefore requiring a different design each time. A solar system does not fall into the category of “one size fits all”. Our sales engineers are here to find the right system for you as solar power does not fit into the "one size fits all" category. The design of a system will vary greatly from property to property and will depend on the type of property you own and how to maximise the benefits of your system. The differences include location, orientation, pitch, equipment and installation method. Our administration team are here to assist you right through your decision making process to the completion of the installation. We can assist you completing all your paperwork for your retailer and distributor in order to get your system up and running as quickly as possible. Once your system is on we are still available to assist you in reading your inverter and ensuring you are gettng the most out of your system. When the time comes, call us for our maintenance package details so you can save save save long into the future. If you have any queries or concerns along the way feel free to contact us to discuss your system in further detail.